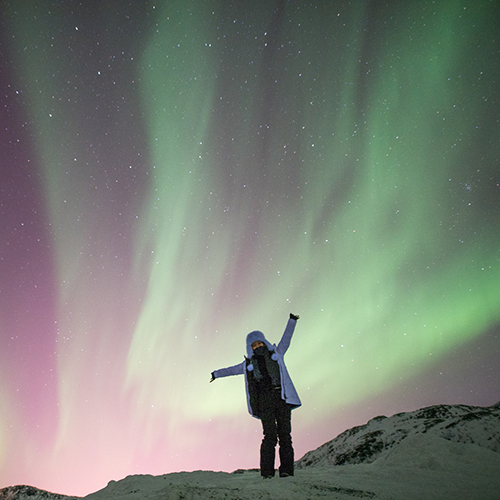 Tromso Villmarkssenter - Northern Lights Tour - With us, you are in the 1st row at the Aurora show. The chase begins now! In a small group of a max of 8 people, we’ll take you to the spots with the clearest sky, take professional pictures and offer help on how to set up your own camera. Photos will be shared with you the following day. If you need a tripod we also got it for you! To keep you warm during the tour we have thermal suits, boots, and heat packs. Later on, we're gonna enjoy the cozy atmosphere around a bonfire, have a warm meal, delicious cookies, and warm drinks. When booking, the customer (and all the people that booked with you under the same booking) automatically agree to the following Terms and Conditions. Please note that You must be at least 18 years of age to make a reservation with Northern Horizon. If you are under 18 you must be accompanied by an adult. If you have any health issues or any medical condition please let us know. We are flexible and more than happy to meet your needs, however, if we will decide that this tour is not suitable for you, we have a right to cancel. If that happens you will get a full refund. Remember to tell us about any health issues in the comment section in our booking form or by email immediately after making a reservation. All the prices you can find on the website (northernhorizon.no) and they are in Norwegian Krone currency. The prices include everything that is listed and pointed out in the description of the tour. There are no hidden/extra fees added to the announced price. When you book a tour with us your card will be charged after you have entered the necessary information, accepted the terms and conditions and submitted your booking. We wish we could, but we cannot control weather conditions or solar activity. Therefore we cannot guarantee that you will see the Northern Lights. We are passionate and experienced Northern Lights hunters. We use a combination of our knowledge and determination to find clear skies and show you the Northern Lights whenever possible, however, the last word belongs to nature. There are no refunds or free trips in the case that we do not see the Northern Lights. Refunds will be sent back to the card that was originally charged for the booking. Depending on your customer's bank, the refund shows up between 5 to 10 business days after we proceed with the refund. other unexpected events that will force us to cancel the tour (such a problem with the vehicle or sickness of the guide). In this cases, you can either chose to reschedule the tour (if it is possible) or opt for a full refund. Also, we are doing our best to ensure correct availability, however overbooking and technical errors with our booking software may occur. In such cases, we will notify you as soon as possible. At the same time, we reserve the right to cancel your reservation and refund the cost. In such a case we will do everything in our power to help you find a similar tour with a different supplier or reschedule your booking. Bookings are only eligible for a full refund if canceled up until 48 hours prior to tour start. Bookings that are canceled after this time will not be refunded. In order to cancel the tour please send us an email at contact@northernhorizon.no. Time of the cancellation will be taken from the time when we receive the email. If you book a tour and do not show up at the arranged meeting point, there will be no refund either. There is no refund given if for whatever season you will not be able to be on time for the tour (for example delayed flights). Our customers negligent or willful acts that lead to their own or others death, personal injury, loss or damage to their and others property. Delays or interruptions of the tour due to naturally occurring events or road accident, illness within the tour group or any other unforeseen events that we had no control over. For any others person`s or company's acts that will lead to delays/changes in arrival or departure of flights. Situations when a third person need emergency assistance (for example road accidents or illness). We are also not responsible for customers expenses caused by road accidents, nature-made accidents, terrorism, broken equipment or other unforeseen events. Northern Horizon has the right to change routes, itineraries or timetables without prior notice if it is necessary. All such losses and expenses are the personal liability of the customer. If there is damage done by the customer to the property of Northern Horizon, which could have been avoided, the customer will be held responsible. The customer is responsible to inform us about any health issues or/and mobility limitations. Smoking is not permitted in our vehicles. Guests are also responsible for selecting the tour accordingly to their interests. We also demand that Norwegian law is respected. If you have any health issues or any medical condition please let us know. We are flexible and more than happy to meet your needs, however, if we will decide that this tour is not suitable for you, we have a right to cancel. If that happens you will get a 100% refund. The Customer who is entering their own personal data by themselves and confirms the reservation automatically agrees to the collection and usage of the information in relation to this Policy. The Customer gives consent and provides personal data by making a reservation in our booking system on our website, through reservation agents, contacting us directly by email, phone or other communication/reservation channels. The Company is keeping and safeguarding Customers personal data in a confidential and secure way. Customer’s personal data is stored in our booking system (currently Zaui), mailboxes, and accounting documentation. Computers on which we access Customer’s Personal Data are accessible to authorized persons only and are password protected. Personal data shall not be disclosed to third parties unless the customer is joining a partner tour or activity. Then the customers’ information will be transferred to the Companys’ partner. We have carefully chosen our partner companies and we believe that they are also GDPR compliant, however, we cannot take responsibility for their individual policies. The customers' personal data will be retained for as long as necessary to fulfill the purposes defined in this Policy. - Customer's name and country. - Customer's contact information (e-mail address, address and telephone number). - Credit card information related to the payments made (Stripe). - Customer's health-related information (non-mandatory). The Personal Data that we collect and store is used to provide our services, to communicate with the guests and for making future reservation easier. We can also use this information to validate your identity and complete transactions, for accounting and legal purposes and marketing purposes. The extent of the required personal data can vary depending on the tour type. Ask what personal data (about him or her) is being processed. Get access to his or her personal data that is being processed. Modify his or her personal data in case the data subject believes that this personal data is not up to date or accurate. Withdraw a previously given consent for the processing of their personal data for a purpose. Request that his or her personal data should not be processed for certain purposes. For example to object to the processing of his/her personal data for direct marketing purposes. Object to automated processing. Request a complete erasure of their Personal data from our database. Ask for transferring (his or her) personal data back or to another controller. In that case, the personal data has to be provided or transferred in an electronic document format. For his or her to be provided back (to him or her) or transferred. When doing so, the personal data must be provided or transferred in a machine-readable electronic format. Due to changes in legislation or for other reasons this policy will be updated as necessary. Please contact us if anything is unclear or you would like to have more detailed information. Please wear warm clothes (at least two layers), gloves and a hat and good winter boots. Tours may be cancelled due to bad weather or an insufficient number of participants. Remember to bring your passport. Please check your email before the tour to get an exact pickup time! PLEASE REMEMBER THAT FROM 16th MARCH THE TOUR STARTS AT 19:30, BECAUSE THE SUN SETS LATER.